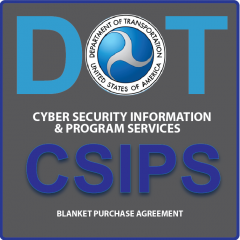 Concept Solutions, LLC is on the winning team to improve the Department of Transportation’s (DOT) Cyber Security Programs’ efficiency and effectiveness, as a sub to General Dynamics Information Technology (GDIT). This work includes providing cyber security and policy services through our high-quality, mission-focused information security solutions. The award is a five-year blanket purchase agreement (BPA), where our team will compete against two other awardees on task orders under this vehicle. Concept Solutions, LLC looks forward to growing our cyber footprint across the federal sector, building on our experience with the Federal Aviation Administration’s (FAA) Security Operations Center (SOC) and NextGen program, as well as our cross-agency cyber policy support.